TWO AUSTRALIAN BREWERIES have apologised and withdrawn a beer named which depicted a scene from the Irish Famine on its label. 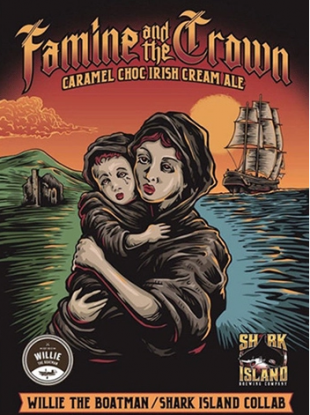 Famine and The Crown caramel chocolate ale was brewed specially for St Patrick’s Day by Willie The Boatman and Shark Island breweries. However, the name and the label caused anger among Irish people at home and abroad, forcing the companies to withdraw the beer and apologise for the offense. Criticism had called the beer “disgusting and offensive” and “an absolute disgrace”. “Firstly, we would like to humbly apologise for the obvious offense it has caused. This truly was not our intention. When we decided to collaborate with Willie The Boatman on a Saint Patrick’s release we were conscious of not delivering a cliché Irish themed beer but wished to express something a little more genuine. “The inspiration for the beer came from the classic Irish song- the Fields Of Athenry, a song that gives me goosebumps every time I hear it. The second verse in particular resonates strongly the strength of the Irish people under extreme adversity, and as an Australian the mention of Botany Bay has always drawn me to the song. It was never our intention to trivialise this terrible piece of history for the sale of a few kegs, but to acknowledge the resilience of the people. “The artwork depicts the scene from the song. “There was no disrespect intended and as soon as we awoke to the legitimately angry, hurt comments we removed the offending title and artwork. The statement was welcomed by the Committee for Commemoration of Irish Famine Victims, who told Irish Central that “anything that educates people on the Great Hunger is to be welcomed, but no-one should attempt to make commercial gain from the suffering of the victims”. Email “Australian breweries apologise for famine-themed beer”. Feedback on “Australian breweries apologise for famine-themed beer”.